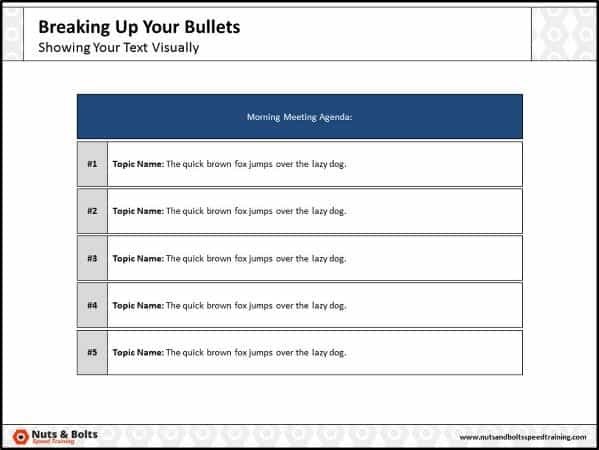 As professionals whose job it is to build content-heavy PowerPoint presentations, we all face the challenge of making standard-looking lists of bullets more interesting and informative, without spending hours and hours in design mode. And let’s face it, the standard advice out there on bullets just isn’t good enough. These people obviously aren’t building the the types of presentations that we are! So the question becomes, how do you take a standard list of bullet points and make them interesting, informative, attractive and conceptual? 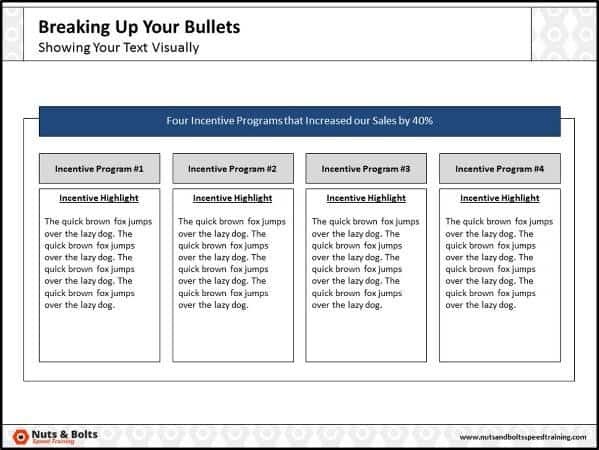 Well a great trick for breaking up your bullet driven content is to move it into individual shapes, and use those shapes to build more interesting layouts for your presentation. Sounds time consuming, right? Well with the right PowerPoint strategies and techniques, it’s not! 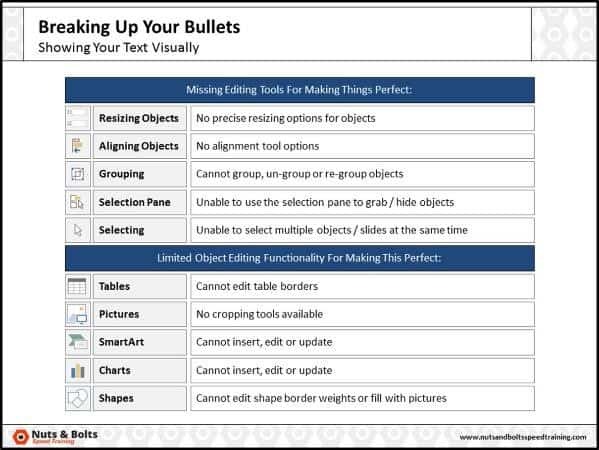 Turn your boring lists of bullets into a graphic by separating out each list item and placing it inside a rectangle. 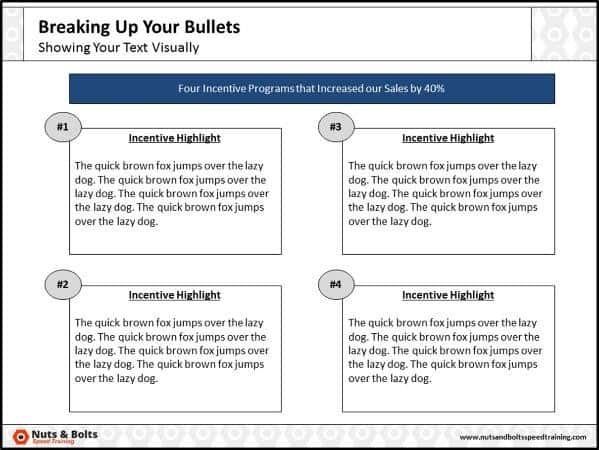 This will make your text look more ‘visual’ while keeping the structure and content intact. Turn each number into a stand-alone rectangle to take your graphic a step further and/or create more variety in your deck. 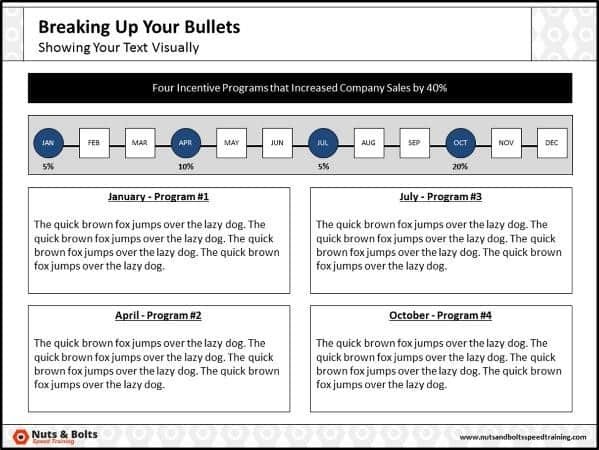 Pull out a piece of your content and use it to create a shape/graphic, such as a timeline, to better illustrate your point. 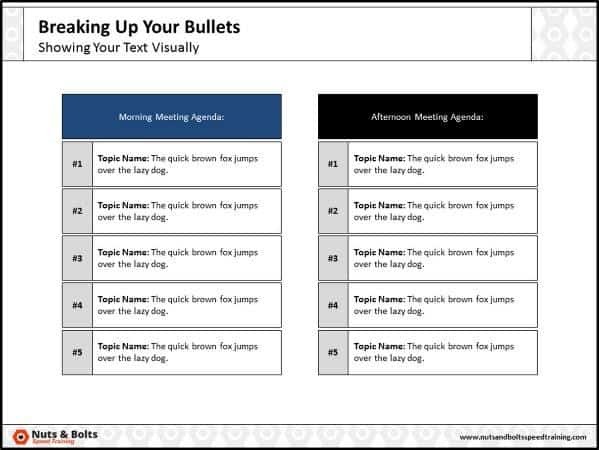 When possible, use icons or small images instead of bullet points. Your structure and content won’t need to change but the overall look will be less generic and more visual. Is there anything we missed? If you have other things related to default formatting that you want to add to the conversation, let us know in the comments down below.